Its been a couple of weeks since I have posted and A LOT of things have happened! Let me catch you up! August 27th: 33 Weeks 4 Days Pregnant- I had an appointment with my OB, Dr. Fong. The appointment went very well!! Camden's heart sounded great and his head was very low. For a whole month up to this appointment my uterus was measuring at 25 centimeters, but at this appointment it was 28 centimeters!! That was 3 whole centimeters since the appointment 2 weeks before! August 28th: 33 Weeks 5 Days Pregnant- I had an ultrasound with Dr. Brown-Elliot. Camden's heart sounded really good and I got to watch him practice his breathing! 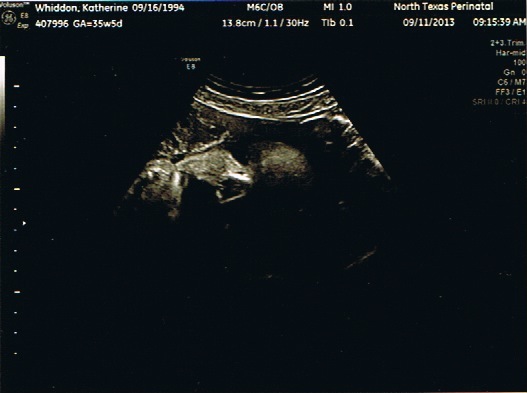 His head was a bit narrow at previous ultrasounds, but now his head is shaped normal. Everything with Camden looked great, but I didn't get any pictures. I had another NST (non stress test) and I didn't have any contractions at all. Camden was moving around so much that the monitor couldn't pick up his heart beat for a while, but he finally went to sleep and he had a steady heart rate of 138bpm for a good couple of minutes. Later that night I started having back pain and painful contraction 2-3 minutes apart. I called my Doctor and he said to head to Labor & Delivery. When I got there my contractions were 1 1/2 minutes apart, so I was given a Terbutaline shot to stop the contractions. I had to stay in Labor & Delivery over night and I received 4 Terbutaline shots to stop contractions, but they would only stop the contractions for an hour. My OB came in and checked me. I was a fingertip open and 50% effaced. I was given a prescription for pain and contractions and my OB put me on bed rest until 36 weeks. Camden's heart sounded great the whole time I was there and he was moving around perfectly! September 3rd: 34 Weeks 4 Days Pregnant- Since I came home from my previous hospital stay, Camden wasn't moving around that much. I drank cold water and soda, he didn't move. I shoved him around in my belly and poked him, and he didn't move. My Mom talked to him and moved him around, and I felt one little tiny movement, but I wasn't sure if it was my Mom moving him or if he moved a little. I was scared out of my mind and getting sick to my stomach. I thought the worse. I headed straight to Labor & Delivery around 10pm. When I got there my contractions were 2 minutes apart. As soon as I was put on the monitor Camden decided that it was time for him to start moving around! He moved around more then, than he had in the past couple of days put together!! I was kept over night and I received 8 Terbutaline shots to stop contractions. I was still having contractions, but they weren't as bad as they were before, so I was sent home that afternoon. September 4th: 34 Weeks 5 Days Pregnant- I had an ultrasound with Dr. Brown-Elliot. The ultrasound went great! He decided to hide his face, so I couldn't get a picture. He weighed 4lbs10oz! That is a whole pound in 2 weeks! I think he is going to be a chubby baby boy! September 10th: 35 Weeks 4 Days Pregnant- I had an appointment with Dr. Fong. I didn't gain any weight in the past two weeks. My blood pressure was good and Camden's heart sounded beautiful. He checked my cervix and I am still a fingertip open and 50% effaced, but my cervix is lower! Dr. Fong is scheduling my csection for early morning on October 4th, but he said that he doesn't think I will make it to October 4th. He took me off of bed rest, but I am to take it easy until Friday. On Friday I am free to be as active as I want and I can stop taking the medication for my contractions! So exciting!! September 11th: 35 Weeks 5 Days Pregnant- Yesterday I had an ultrasound with Dr. Brown-Elliot and after that I had a care conference with everyone who will be involved with the birth of Camden and the people who will be caring for us after the csection. During the ultrasound Dr. Brown-Elliot zoomed in on Camden's face and he opened his eyes and started looking around like he was watching something. It was so weird watching his eyeball move around. We got to see him blink too! It was the weirdest thing I ever saw! We also saw him drinking amniotic fluid. I am so in love with my baby boy. 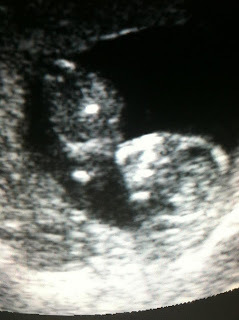 It was the best ultrasound so far! My care conference went amazing! Every question I asked was answered and most of my wishes will be made! I was also set up with a social worker and I am very hopeful that we can get some kind of insurance for Camden, that will be an answered prayer! I love everyone who is going to be caring for my sweet boy! I feel so blessed that we have such an amazing group of people. It won't be much longer before my baby boy is here. 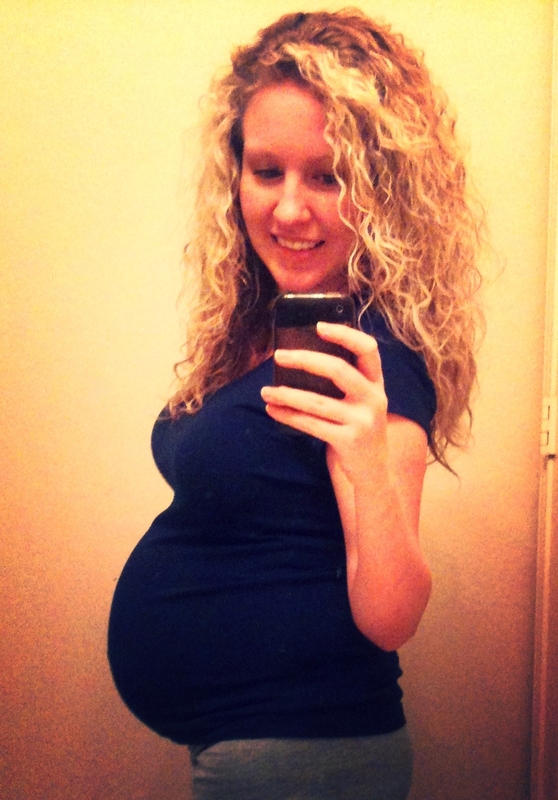 3 weeks until my scheduled csection, but I really think that he will be here within the next 2 weeks. I am very excited and I am very much ready! "I am a consultant with Thirty-One Gifts. From now until September 28th, I am sponsoring a fundraiser for my friend, Katie, and her sweet baby, Camden. Camden is due in early October. This little guy is very special and he is going to need a lot of extra TLC!!! Camden has no legs and only his upper arms. Because of this, he is going to need a lot of special equipment to help keep him safe as he grows and develops. Please take time to read her blog at http://admirablydiverse.blogspot.com/ I know her story will touch your heart!!! The purpose of this fundraiser will be to help Katie and her family offset some of the upcoming medical expenses they will incur as well as with the purchase of equipment needed to meet the special needs of her sweet little man. How to participate: Simply go to www.mythirtyone.com/tjmoon and find the event titled "Fundraiser for Katie and Baby Camden". Click on the "shop now" link associated with the fundraiser, click "shop now" again (the pink button) and begin your shopping!!! The catalog you will be shopping is the new fall line! They have a lot of awesome new bags and prints out so have fun and remember it's for a good cause! If you don't care to make a purchase through Thirty-One with me, you may also go to Katie's blog and just make a donation on her behalf. All orders can be shipped directly to the address of your choosing. All proceeds from any order placed under this event will go to Katie and Camden. If you have any questions or problems, please contact me via FB, email (tjmoon08@gmail.com), or phone (229-834-5701). Thank you!!!" 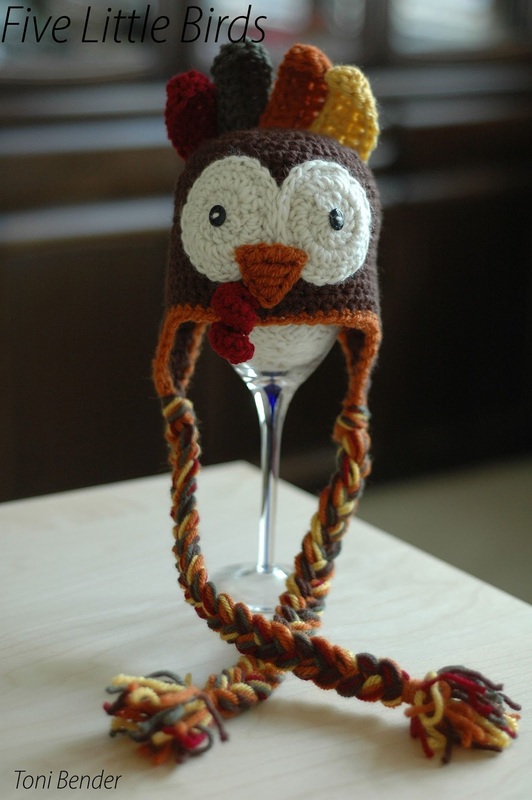 And yes, I just have to share another hat that my Mom made! This will be Camden's Thanksgiving hat! I am so in love with it!! If you would like to order any hats or photo props from my Mom, please go to this link: https://www.facebook.com/fivelilbirds Don't forget to 'like' her page!